== PLEASE NOTE == Some of the details and features in this post have been superseded. Please review our Modern Driver Management and Modern BIOS Management solutions for up to date information. To give you a bit of background to this post, Nickolaj and I sat down back in February and discussed some of the pain points in relation to OS deployments. The main theme that community members had was around the area of driver management, with conflicts over driver package best practices, performance issues and general overhead for the ConfigMgr administrator. Back in late March of this year we released our “Modern Driver Management” method of dynamically managing driver deployments as part of your OS deployments (https://www.scconfigmgr.com/2017/03/29/modern-driver-management-using-web-services-during-osd-with-configmgr/). The process works by utilizing a number of tools we have developed to fully automate the process of driver management from the download step right through to deployment at the client. Since then we have been thinking about some of the issues and points raised by the community around the area of BIOS deployments, and how best to handle them. Dell has been pushing their Flash64w flash BIOS tool recently allowing for BIOS upgrades during the WinPE phase of your OS deployment. Now with additions to all parts of our “Modern Driver Management” engine we are pleased to support the automatic deployment of Dell BIOS updates in your task sequence using our “Modern BIOS Management”. Oh and for those of you who were looking for Lenovo and HP, we are working on it and we should be publishing a Lenovo update shortly and hopefully following up with HP at a later date. This initial step uses our “Driver Automation Tool” which currently supports a number of manufacturers (Dell, HP, Lenovo, Microsoft & Acer) for drivers and a subset (Dell/Lenovo) for BIOS downloads. It is vital that the tool is used in this process as it standardizes the naming convention of packages and includes tools which we will utilize later on in this process. The web service is a key function to this process as it will be used during the task sequence to query the available packages from ConfigMgr (using the GetCMPackage function) and through logic in a PowerShell script, match available BIOS packages to the model and manufacturer of the machine being deployed. 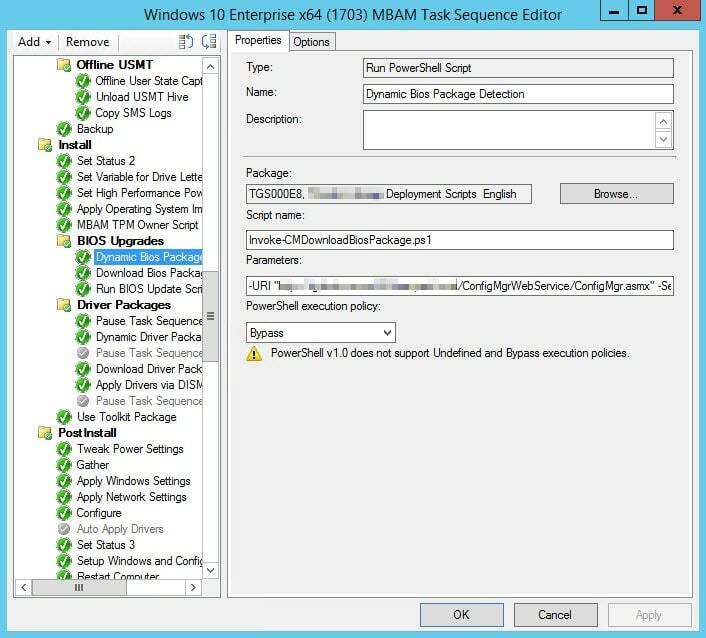 The Invoke-CMDownloadBIOSPackage script will automatically detect the computer model and manufacturer, calling the ConfigMgr WebService for BIOS packages matching those values. In the case of multiple packages that match the criteria, the most current package will be selected based upon the SourceDate property of the package object. If there’s no matches at all, the script will exit with a return code of 1, causing the deployment to fail. In terms of logging, the script is writing to a separate log file called BIOSPackageDownload.log located in the same directory as the smsts.log file at the time of operation. Note: Some older Dell models do not support Flash64W, so if a failure code other than “2” which indicates a reboot is detected, a task sequence variable (SMSTSBIOSInOSUpdateRequired) is set. You can then use this as variable as a condition to re-run the powershell script in the OS section of your task sequence, as the script will detect it is no longer in WinPE and attempt to update the BIOS using the legacy method. For those of you running previous versions of the tool, the individual script created for updating the BIOS has been removed as this is superseded by the Invoke-DellBIOSUpdate.ps1 script. For Lenovo downloads, please select download type as “All” and select an appropriate OS to get a model listing. I will be changing this in the next release with a different XML method. Windows 10 1xxx downloads are for HP only at present. Other vendors support for the new builds remains in the standard Windows 10 download packages. I’m having issues with getting this to work and was wondering if you could lend a hand, the package is detected and downloads the BIOS update to the client however it appears to fail before it runs as the DellFlashBiosUpdate.log isn’t created. Content successfully downloaded at C:\_SMSTaskSequence\Packages\CC3001EA. The script only mentions Dell in the name–will it update Lenovo too? Lenovo support is coming at the end of the month following some more testing. WARNING: An error occured while updating the system bios. Error message: The argument is null or empty. Provide an argument that is not null or empty, and then try the command again. I’ve confirmed that my settings are the same as in the post, and even tried using a different variable but I still get the same issue. Is there something that I’m missing perhaps? 2) Package wasn’t deployed to a DP! Hi – I am having an issue when iam not setting a password for the bios upgrade. I think that the password variable is never $null even if i do not put a password. What do the results of the DellFlashBiosUpdate.log look like?. I didn’t see this log when i got the error so i comment the password line in the script and it didn’t work either. But then i check the content of the bios package that the tool did and it didn’t contain the dell flash64 binary. It was weird but when i check the source files the binary was there just not in the distributed content. I think the content was distributed before the flash64 is copied. Thanks for your time! On dells website, the Dell Precision T7810 model is currently at version A19. I simply downloaded this BIOS update from Dell and created the appropriate folder structure on my share to place it there. I packaged the BIOS update manually and it still works during the task sequence. thought i’d give you a heads up on this. On the surface it looks like there is a bad link contained within the Dell XML. I’ll investigate this. Im experiencing the same issue, on latest attempts to download Dell BIOS, it only downloads the Flash64W.exe file not the bios itself, so TS gives error with unable to find a payload.. I have been onto Dell about this as the XML is referencing files which simply don’t exist. This is unusual for Dell, hopefully they will resolve these issues soon. Is there any way in future Versions of the script, that you can verify the files exist, instead of just checking the package is present? That the completion of the package is not done, before the actual file has been verified downloaded and placed in folder? I’m already working on it now due to the download issues. Expect an update in the morning. I’m having issue with matching multiple models example Dell Optiplex 9020 and Dell Optiplex 9020 AIO. As per the script it “Determine the latest BIOS package by creation date”. But it won’t work in this case, because either of the package created before or after. Let me know what needs to be done in this scenario. Do you have copies of the logs you can send over?. In the above, you can see Match found for two model like Dell Optiplex 9020 and Dell Optiplex 9020 AIO. So as per the logic it takes the latest package creation date and it returns the version is up to date. But actually it is not. Thanks for the log, I can see what is happening here. The 9020 AIO bios package looks to have a newer created date, given this it has selected this option with the present A15 bios (https://www.dell.com/support/home/us/en/04/drivers/driversdetails?driverId=3KR7M&fileId=1956811526&osCode=W764&productCode=optiplex-9020-aio&languageCode=en&categoryId=BI) and compared the versions. Now off the back of this both Nickolaj and I have been talking and we are going to put changes into the Driver Automation Tool and scripts to better cater for these sub-models from the likes of Dell. We have identified a more consistent method of matching models and this will be implemented shortly. If you need a quick work around you could change ($PackageList = $PackageList | Sort-Object -Property PackageCreated -Descending | Select-Object -First 1) to ($PackageList = $PackageList | Select-object -First 1) as the 9020 is matched first and therefore the bios version comparison will download the A20 release for the 9020 (https://www.dell.com/support/home/us/en/04/drivers/driversdetails?driverId=F6F4J&fileId=1957973084&osCode=W864&productCode=optiplex-9020-desktop&languageCode=en&categoryId=BI) assuming you have it packaged. Thanks for the information Maurice. For time being I will use the work around. thank you again. Hi Maurice .. I have the same issue as Suresh, multiple 9020 models 9020M, 9020 AIO, etc .. and the 9020m firmware is being selected each time. I tried the quick workaround you mentioned but a precision workstation Firmware was downloaded instead! Have you put the changes into the driver automation tool you mentioned in your previous post that cater better for submodels? Great work btw and thanks in advance. Can you please advise what version of the Invoke-CMDownloadBIOSPackage.ps1 you are running?. There is also quite many bugs in the BIOS driver download regarding proxy usage. So if you do that instead, then all the Proxy problems futher below the line are fixed. There is now only one small one, that the BIOS flash utility could not be downloaded – it fails with Proxy authentification is required. I have not found the solution for that yet. Another thing is that it does not save the proxy settings in the settings file. Or at least not reading them when opening again. I Need to enter them every time. OK, I was too fast about posting above. I actually ended up needing fixing all the bugs above + Replace all “-ProxyUsage SystemDefault” with “-ProxyUsage Override” as posted in the drives section + use the proxy settings in the link below to get all things to work. Could not load file or assembly ‘Microsoft.ConfigurationManagement.ManagementProvider, Version=5.0.0.0, Culture=neutral, PublicKeyToken=31bf3856ad364e35’ or one of its dependencies. The system cannot find the file specified. If they are missing, find them in the SCCM _console_ installation folder and copy them here. You’re exactly right Christian, thanks for helping out! I have some issues updating BIOS using Invoke-CMDownloadBIOSPackage.ps1. My problem is that even though I have a BIOS package generated by DriverAutomationTool the script returns 0 packages. Manufacturer determined as: Dell Inc. The webservice works just fine for OSDFrontEnd and the service account have proper access in ConfigMGR. The query returned 0 entries for any packages with the word BIOS. Can you please check that the account you have set up for the service to use has read access to the configmgr environment. It is working as expected now. After checking everything several times I noticed that one character was missing from the SecretKey. I really look forward to stop handle BIOS and drivers manually. Keep up the good work! when a device needs a Bios Update the script works perfectly! I only have an issue with the Invoke-DellBiosUpdate.ps1 Script when the Bios is already up to date. Failed to run the action: Run Bios Update Script. I found a solution by myself –> in the “Download Bios Package” and “Run Bios Update Script” steps i check if the Task Sequence Variable “NewBIOSAvailable” exists. If not it doesn’t run these steps. I am running into an issue when the invoke-cmdownloadbiospackage.ps1 runs it is finding a match for each model and trying to install the incorrect bios for the model. I am only seeing this issue on this one model of hardware. Can you please obtain the system SKU value from WMI on both models for me?. Hey Maurice, I’ve seen a similar issue with the SystemSku property not being populated on some Dell models like the Latitude E6230. I adjusted line 338 in Invoke-CMDownloadBIOSPackage.ps1 v2.0.0 to use the SystemProductName property instead as it seems to be more reliably populated as the model number (e.g., “Latitude E6230”) than the SystemSku property. Im trying to set up Modern Bios Management. In our environment we have mostly lenovo laptops. I already have installed the webservice and downloaded all bios with Driver Automation Tool. Something I don’t understand, when Bios is detected ok, how does the script get the right new bios? Do I have to point to bios packages inside the script? The second part in task sequence Download Bios Package is greyed out in guide? One more questing when we have no bios password in our laptops, then what should I do? The BIOS is matched from the list of matching BIOS downloads returned from the web service, then a variable is then set with the package ID and the package is downloaded automatically. The BIOS is then installed using the Invoke-XXXXBIOSUpdate.ps1 script where XXXX is the chosen vendor. For more information see this page – https://www.scconfigmgr.com/modern-bios-management/ and note that the password is not a mandatory parameter (Mandatory=$false) so you can just leave it out for laptops without a BIOS password. I am getting the following error in the SMSTS log file when i run the TS. The argument ‘Invoke-DellBIOSUpdate.ps1’ to the -File parameter does not exist. Provide the path to an existing ‘.ps1’ file as an argument to the -File parameter. Can you please provide the full command line you are trying to run?. How are you guys setting up this script in your TS? You should be using the run PowerShell script options for this, using the command line run will work but you need to double quite the PS1 file name. Hello, could you help me with Invoke-CMDownloadBIOSPackage.ps1 script? When I deployed it with task sequence by SCCM 2012, it returns error code 1. When I open the log, I see the error, that it can’t establish the connection to ConfgMngrWeb service, and URI isn’t valid. I check my secret key, give acess on IIS to application by network sccm account, but nothing to help.